What Does Code P0670 Mean? OBD II fault code P0670 is a generic code that is defined as “Glow plug control module -circuit malfunction”, and is set when the PCM (Powertrain Control Module) detects a failure of the glow plug control module itself, a failure in one or more of the circuits that supply the glow plug control module with power, or a failure in one or more monitoring/communication/signal circuits that connect the glow plug control module with other control modules in the CAN (Controller Area Network) bus system. Note that on some applications, “circuit malfunction” could also mean that a circuit failure exists between the glow plug control module and one or more individual glow plugs. During normal operation of a diesel engine, combustion of the air/fuel mixture is accomplished by heating the mixture adiabatically, i.e., by heating the mixture through compression when the pistons are moving upwards during their compression strokes, and provided that the engine and all the components of the fuel injection system are both in good mechanical condition, the air/fuel mixture will combust completely. Note though that the high speed at which the pistons move upward during the compression stroke greatly assists in heating the air/fuel mixture when the engine is running. However, at low ambient temperatures, it can be very difficult to ignite a diesel fuel/air mixture at start up because not only is combustion less efficient at low temperatures, but also because the air fuel mixture may not be compressed sufficiently to initiate combustion at engine cranking speeds. Thus, to eliminate these problems, diesel engines use electrically heated glow plugs to provide a source of heat in the pre-combustion chamber of each cylinder to assist in igniting the air/fuel mixture at the compression peak. In terms of operation, glow plug control starts when the ignition is turned on. At this point, the PCM receives input data on the engine coolant temperature (from a dedicated coolant temperature sensor), which on most applications, has to be below about 1040F (400C) for the glow plug circuit to be activated. If the PCM determines that the engine coolant is below a pre-defined minimum threshold, it will activate the glow plug control circuit via the glow plug control module. The biggest practical advantage to using a dedicated glow plug control module is that unlike older control systems that supply all the glow plugs with current simultaneously, most dedicated control modules can supply each individual glow plug with current separately. Moreover, since modern glow plug control modules can sense the electrical resistance in each individual glow plug, it can feed varying amounts of current to different glow plugs, which has the practical advantages that all glow plugs are heated equally, and that the overall heating time for all glow plugs is therefore greatly reduced. In turn, reduced warm-up times means that cranking times of cold engines is also reduced, which extends the life of the starter motor. By way of comparison, some older glow plug control systems took up to 10 seconds (and sometimes longer) to heat up the glow plugs, whereas modern systems can heat up the glow plugs in less than three seconds. From the above it should be obvious that the glow plugs and their control circuits/mechanisms are critically important parts/components of a diesel engine, because if the control circuit fails, there is a high likelihood that if the engine is cold, the engine cannot be started, or that it can only be started with difficulty. Therefore, if the glow plug control circuit fails, the PCM (or other control module) will set code P0670, and may also illuminate a dedicated warning light. Where is the P0670 sensor located? 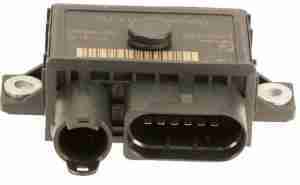 The image above shows a typical glow plug control module, but note that the actual appearance of these modules vary greatly between applications. Also, note that although the glow plug control module(s) are usually located in the engine compartment, and often close to the engine to keep the leads to the glow plugs as short as possible, it may sometimes be necessary to remove or partially disassemble unrelated engine parts/components to gain access to the glow plug control module(s) for the purposes of testing and/or replacement. If a manual for the affected application is not available for the purpose of identifying and locating the glow plug control module, one other way to locate the module is to locate the glow plugs on the cylinder head(s), and then to trace the leads back to the control module(s). Note that since glow plugs and their leads resemble spark plugs and spark leads, finding the glow plugs in a crowded engine compartment can me made easier if one looks for parts that look like skinny spark plugs that are screwed into the cylinder head(s). What are the common causes of code P0670 ?